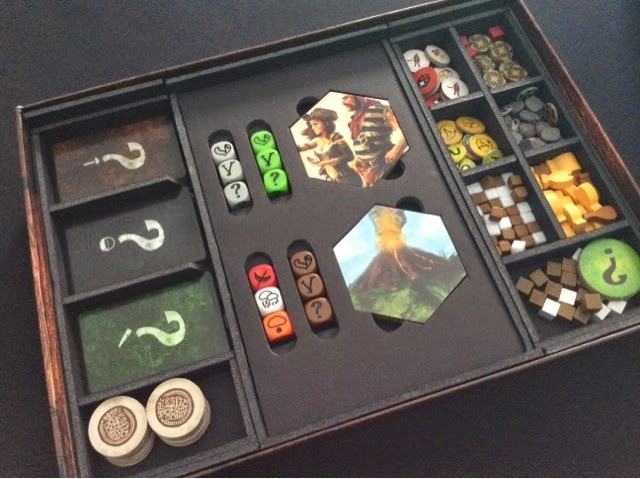 So first up is the custom insert! 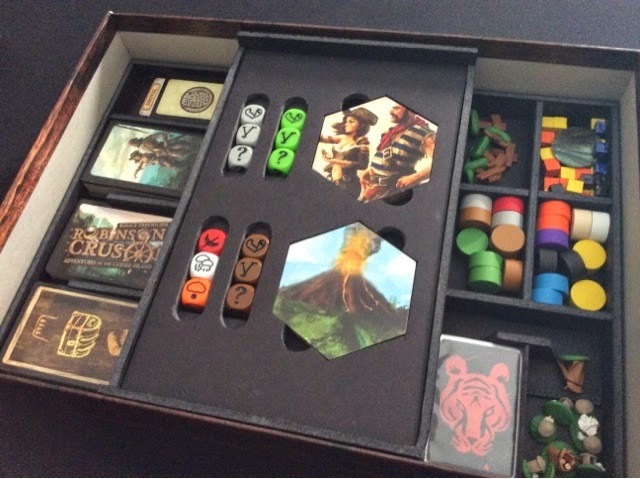 It is a 3 piece insert which contains 2 removable trays that hold the adventure cards + discovery tokens, and the other smaller bits such as wood, food, determination tokens etc. 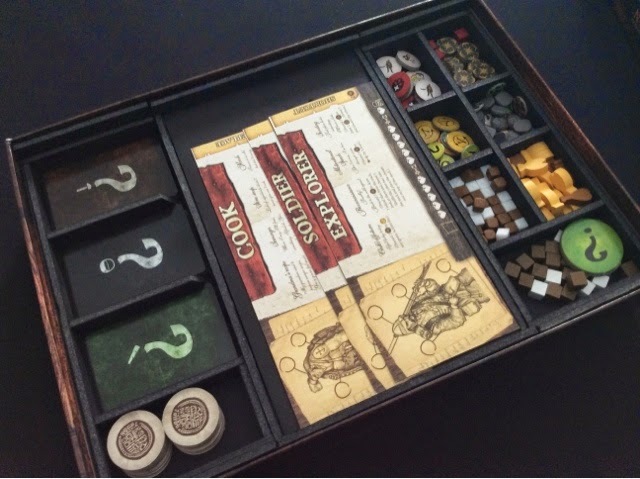 Before I got this insert, all my bits were in small plastic containers that I had to individually remove, open the lid, and place near the board within easy reach. The setup time was horrendous as there were just so much stuff! 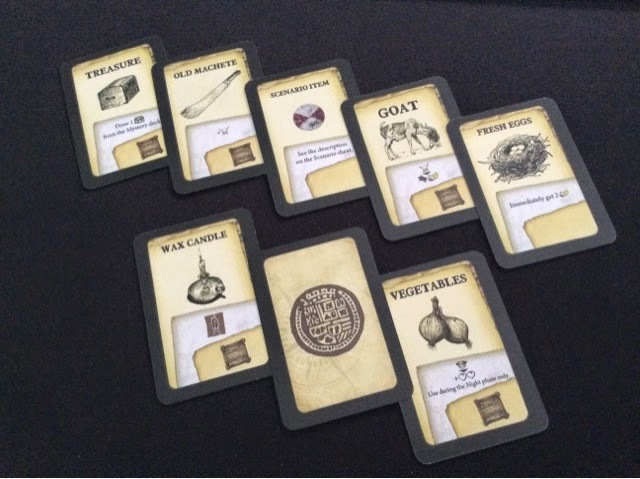 Wood, food, determination tokens, modifier tokens, blue+black+white markers. Everything was scattered everywhere. And keeping when the game was done was even worse. With the 2 removable trays, all that was cut down into mere seconds. 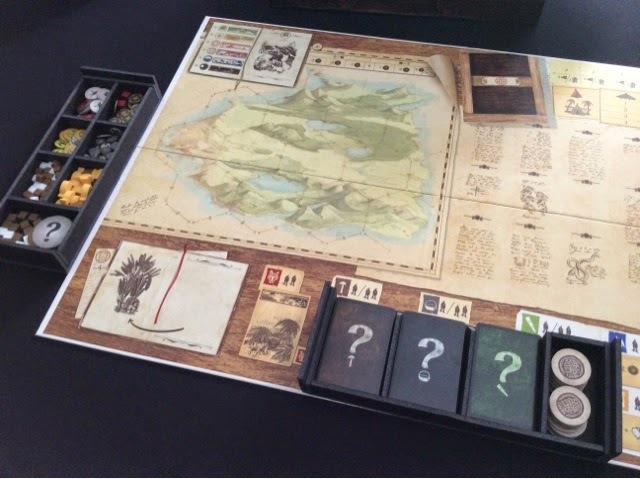 The left tray with the adventure cards can be placed straight onto the board, and the right tray with the tokens just needed to be within easy reach. And that was setup! Easy peasy, neat and quick. What lies below the removable trays are basically all the other bigger bits and other decks of cards. As for the tiles and the dice, well, I guess you can plainly see where they are located. I would have loved to swap them around, invention cards on bottom right and my custom bits on top left. It would have looked perfect! Well, regardless, it works, and it helps me in setup and tear down and sorting of all my stuff. One can't be too picky in life. Next up are the custom bits! Above is my custom shelter token which I really really like. I love the detail put into it and how it stands out on the map. 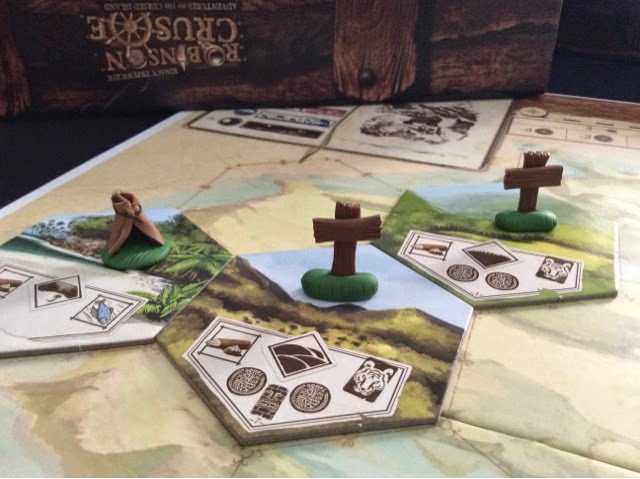 The crosses are just as nice although I admit it is rather extravagant considering I only get to use it for scenario 2. Haha. Still, it's nice! The wood looks ultra realistic. 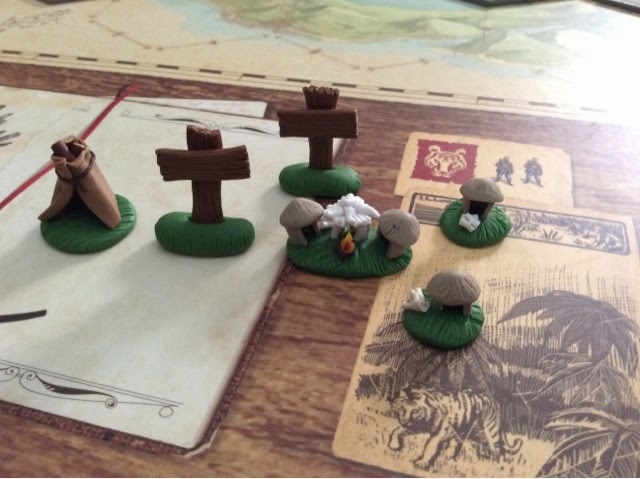 Below I have pictures of the custom huts and village done for the cannibal island scenario. I found it much easier to track which tile has a village (hut) that we cannot enter, and when defeated we could use the number tokens provided to signify that it was burnt down. Having the number tokens signify multiple things but placed differently on a tile was rather confusing. 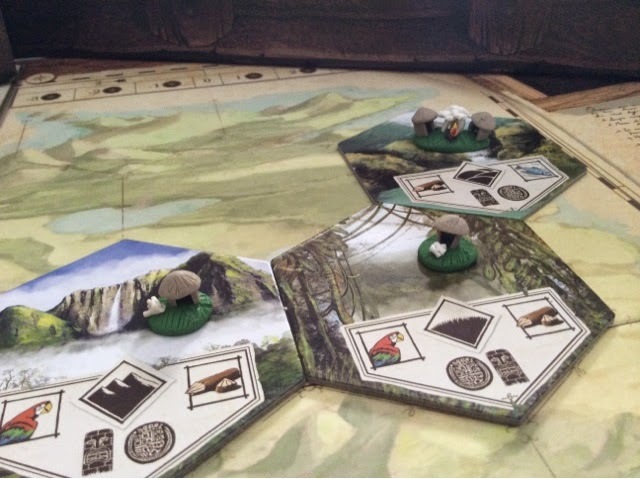 I would have liked the huts and village to be bigger to match my shelter token, but I think they function just as well in their smaller size. 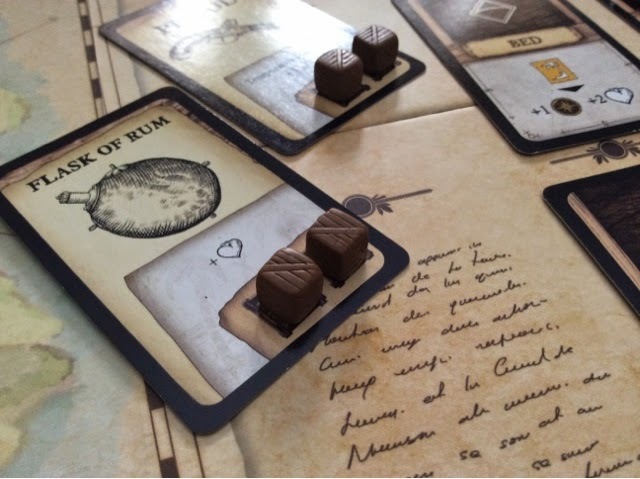 Can you believe I pimped out my Robinson Crusoe so much ? I think I might have lost my mind. Haha. Below you will find the discovery cards to replace the discovery tokens. 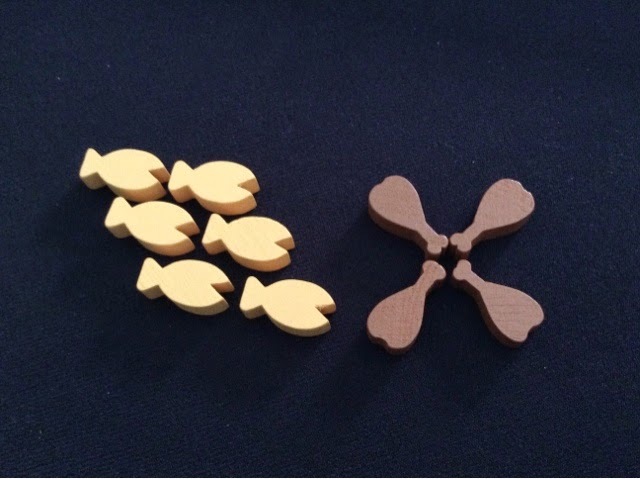 The idea was taken from that done by BGG member Doug Evans. 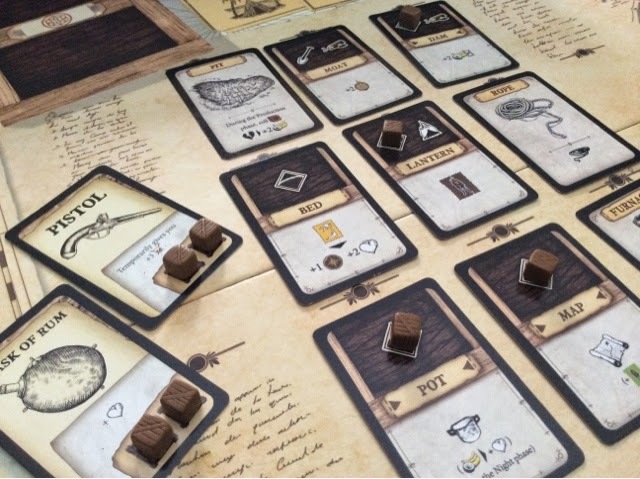 He designed the whole thing and uploaded it unto BGG. I got mine printed at printerstudio and it turned out really well. Linen finish and all. Sweet. My friends used to love to pull the tokens from the bag, said it was the most fascinating part of exploring. Well I liked that too, so the cards took that excitement away a bit. But once we could tell what we got, "we found a goat! ", I think we much prefer what the cards added to the theme. Nothing evokes story better than being able to talk about what you found rather than seeing a token and saying you have a chance for 1 meat and 1 fur. Discovery cards to replace the discovery tokens. More thematic! With text to imply time of usage. He posted a picture on BGG and I loved it, so I had to buy it. Haha. The stones are only used to signify when a source has been depleted, or when a terrain has been unexplored. The size is just right to cover the image on the tile and I like that I don't have too many similar color cubes sitting all over the place on invention cards, morale track, etc. And it fits the theme! He also did a set of crates to replace the cubes from the game ( some of them, not all ). But it made me think very hard about buying them. 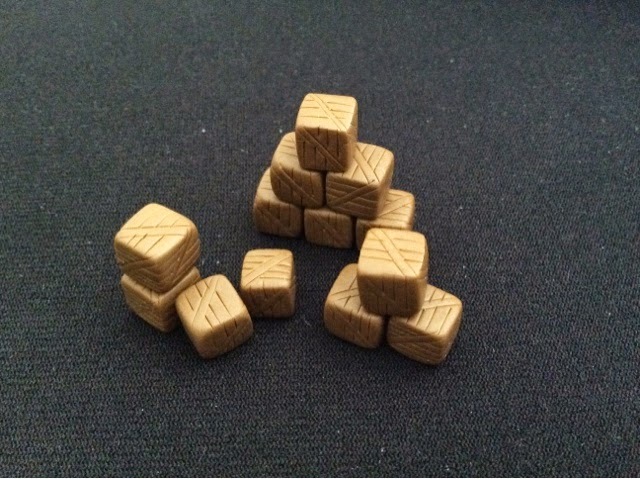 So as it is, I settled for my own custom tokens taken from my Stone Age resource set. 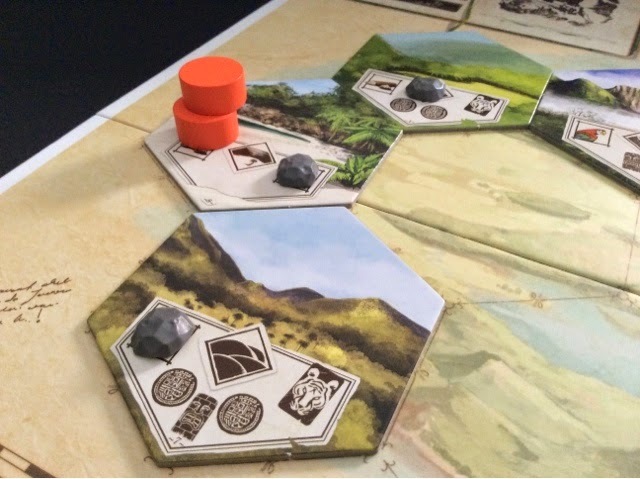 I sold off my copy of Stone Age but retained my resource stash that I bought for it. Well, don't let it go to waste! The last one, but a heck of a long one. Took me awhile to get all the images done and uploaded. 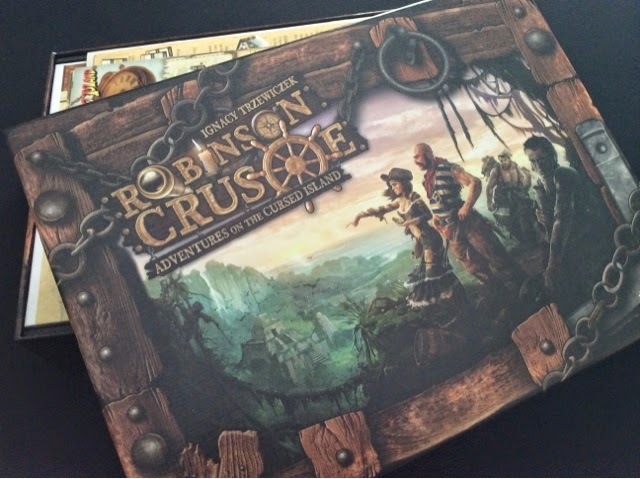 But I just had to, I love my pimped copy of Robinson Crusoe too much. Haha. Just taking it out to mess around with the bits is hugely satisfying for me. But for now, these pimped components really help to bring out the flavor in my games, and also to aid in setting up and tearing down. With so many games to play and so little time, every little bit makes a difference! This is probably the last pimping post of mine for awhile. Nothing else new to write about. But if I do pimp out another game soon, well, you will find out! This is amazing. good job! If I may ask, how did you make the middle tray? 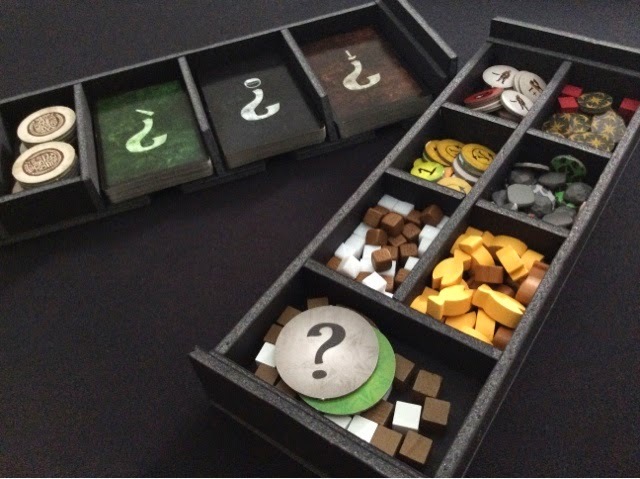 I'm curious as to what is around/under the tiles, is it just foamcore put together as a "hole" to fit them? I was thinking it'd be cool to do something similar for the room boards in Theseus. Thanks! The insert was not made by me, in fact, all the inserts I have shown in my series of "nothing says I love you like pimping" are all made by the very talented Chris Whitpan. Glad you like the Discovery Token cards! :) For anyone wanting to print the files using Printerstudio, Artscow or similar, may I suggest that you download my archive containing the individual images from BGG. (Doug kindly collated my images into a pdf for those that just wanted to print and cut themselves, but my original individual jpgs would be much easier to upload to e.g. PS.) Beware, however, that I have revised the image for the card backs, so your cards will come out slightly different than those you see here. I must know where you got that insert! That's exactly what I'm looking for.